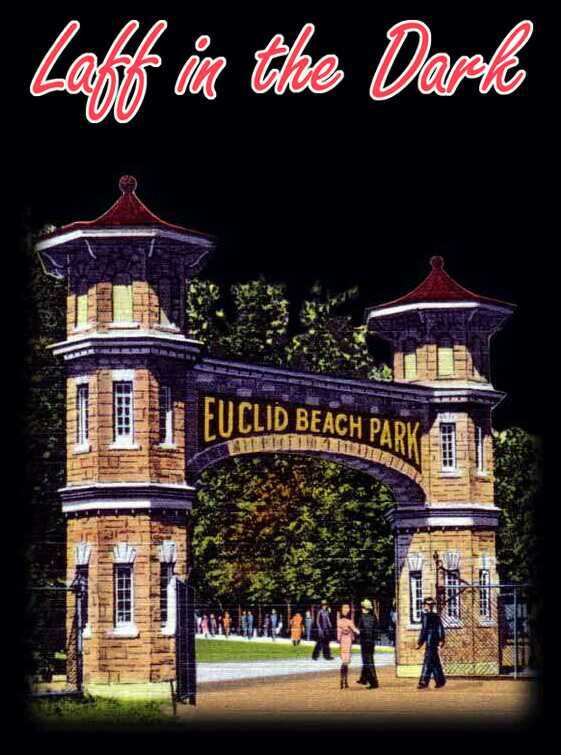 Growing up during the thirties and forties in Cleveland, Ohio, a favorite family outing and a special treat for me was a trip to Cleveland's famous EUCLID BEACH PARK. Although I was fascinated with the highrides I was intrigued and frightened by the LAFF-IN- THE-DARK ride. Despite the fact that the park closed in 1969, the memories of its food and rides are kept alive today through a club called The EUCLID BEACH PARK NUTS, several excellent books and videos, and mall shows. Their famous popcorn, popcorn balls, candy kisses, and frozen whip are still being made and sold today. 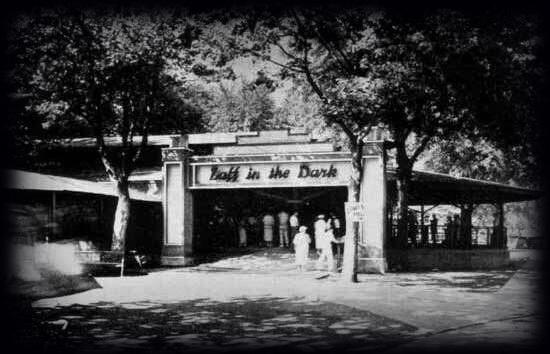 The LAFF IN THE DARK building did not start out as a dark ride. Back in the 1920, it was an open-sided building which housed the new WITCHING WAVES ride. Although EUCLID BEACH PARK was always introducing new and unusual rides, this one apparently was a mechanical nightmare. It was removed in 1931. The building was then enclosed, and the cars were equipped with motors and a guidance system that could follow a twisting track. The building was huge measuring 192 x 8(L) x 56 x 8(W) x 17 x 8 (H). According to the drawings, the twisting track measured 1112 1/2" in length. I thought I'd been told they could run 40 cars on the track, but that sounds a bit crowded. I noted that the drawing indicates a storage area for 26 cars and that sounds a bit more realistic. I do know that when they were running full tilt, the cars were dispatched very close to each other. When I worked at the park during my college years I had heard that one of the members of the family that owned the park nearly died when he was overcome with fumes from painting the inside of the enclosed building black. As a small child I had a hard time with this ride as the paintings on the facade were scary and then there was that small black hole where the cars entered and disappeared. I usually made it as far as the first stunt and then I closed my eyes and hung on for dear life for the rest of the twisting journey. That first stunt appeared to be a pile of cloth, but as the car approached it became a ghost that came toward you. In later years when I got past that point, it was fun and laughs all the way. The large interior was divided into two areas so that at times in the dark you could easily hear other sounds and screams. The ride used many sudden sounds such as crashing cymbals, horns, clatter blocks, and of course sirens. As I recall, there was a dragon near the ceiling that you could see at different times during the ride. Many stunts just suddenly appeared such as a gorilla, spider, eyes, lightning, and near collisions with mirrors and posts. I recall a doctor's office door appearing and as the car approached it quickly opened revealing a skeleton. There were also several enclosed scenes. One I recall as being a cave where a lion would jump out at you. One of the more startling effects for me was, while riding in the dark, hearing a train whistle, and seeing the front of a train swing into my path to be hit by the car as the light went out. I don't remember seeing that stunt in later years. Perhaps it was too difficult to maintain. The ride also used crash-thru doors disguising as brick walls, rocks, or just blackness. Euclid Beach Park was noted for innovation. They had a very good R&D department that came up with many items that are used today. One of those was the use of ultra-violet light (blacklight) developed by chief engineer Dudley Humphrey Scott for use in their dark ride to make it scarier. They also were one of the first to use the revolving barrel stunt in a dark ride. The barrel was about 24' long painted black with phosphorescent stars painted on it. Under the track were bright lights that would excite the paint until a car approached and the lights went out. Now all the rider saw was this disorienting field of stars revolving around him. As most people know, riding or walking through such a stunt leaves one convinced they are turning upside down. During my college years I worked across from the LAFF-IN-THE-DARK on the FLYING TURNS, one of the parks famous coasters. I was curious about the dark ride and more than once went over in the morning while the lights were on and walked the track. The operators tried to get me to walk through the barrel with the lights on and I couldn�t make it. Of course there were no handrails, so it was very easy to lose your balance within the barrel. As I mentioned before, the ride had a high capacity for a dark ride. When they had all the cars running it took two operators, one at dispatch and one stationed at the unload position to speed up the unloading as riders were likely to sit there laughing and talking about the ride. As I recall both dispatch and unload positions had steel runners that held the car secure during load and unload and could prevent a following car from bumping the loading one. They also used a transfer platform much like the coasters to add or remove cars from the main track. I understand that some of the stunts still exist in private collections. I've always wondered what became of all those cars? Surely there must be one or two around in someone�s garage. In the near future the EUCLID BEACH CARROUSEL will once again be in operation in downtown Cleveland, and I hope that a proposed museum will also be built as part of that complex. 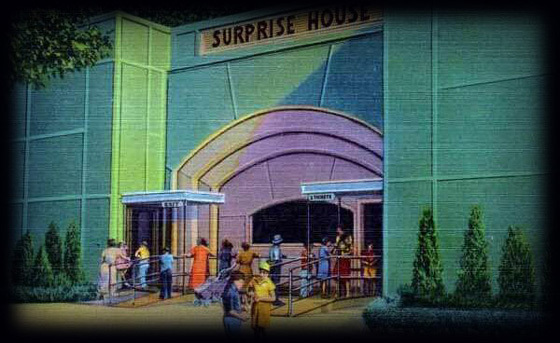 If so, perhaps more memorabilia will appear from the famous LAFF-IN-THE-DARK ride at EUCLID BEACH PARK. For those interested in more information on EUCLID BEACH PARK and its rides you might write THE HUMPHREY COMPANY, 20810 Miles Parkway, Warrensville Hts., OH 44128 or call 1-800-486-3739.